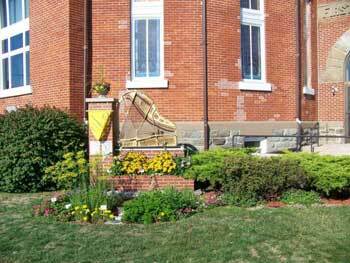 The Ludington Area Center for the Arts (LACA) is the gathering place for community expression through arts and cultural experiences. Since opening in September 2008, LACA has proven to be a valuable asset to the Ludington area. Throughout the year, the Center hosts exhibitions, performances, and educational programs in music, the visual arts, literature, and more. Click here for a complete list of performances. The facility includes a 250-seat performance hall; the venue is handicap accessible with a stair climber lift. With the removal of the fixed pews in early 2019 and replacement with movable chairs, the performance hall space has become a much more versatile venue. The gallery and exhibition space which doubles as a banquet hall are located on the main floor. Art studios and classrooms are found on the lower and upper levels of the facility. Completed in Fall 2018 is the Art Library on the second floor. Named for Bill & Jane Carpenter and John & Marion Riedl, the library features over 1,000 books of art history, artists, and instructional materials. Books are available for sign-out on an honor system. The Main Gallery of the Ludington Area Center for the Arts is host to several exhibitions throughout the year. In addition, a second Gallery space is located in the Performance Hall Lobby area and a new exhibit area, The Unframed Gallery, has been developed in the Performance Underground Room 101 on the lower level. Click here for the current exhibitions. All exhibitions are free and open to the public. In addition to the monthly or bi-monthly exhibits, one-night only PopUp Art Shows are periodically scheduled in the Main Gallery space. The PopUp shows are an "exhibit within an exhibit" and offer artists with a smaller inventory a chance to show off their art. 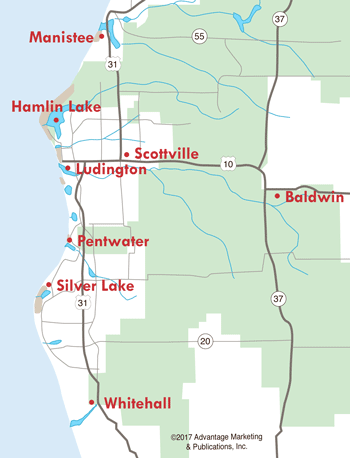 Ludington Writers offer monthly writing and critique groups. The West Side Gang Writers Group meets the 2nd and 4th Tuesdays to discuss works in progress; Third Tuesdays are devoted to sharing work that is inspiring. The group also sponsors writing workshops. Visual Arts Critique Group includes two separate groups, one meeting in the morning, the second in the evening. The morning group meets the third Friday at 11am. The evening group meets the fourth Monday from 7-8:30pm. Music jam sessions are held over the lunch hour (11am-1pm) in the gallery at LACA. It is open to all area musicians on a drop-in basis. An Acoustic Jam is held Wednesday evenings (6pm-8pm), in the Gallery space and is also open to all interested musicians. The arts and crafts studio offers a bright and airy space in which to learn a new skill or improve on one and is the site for various workshops throughout the year. Other workshops are held in the Main Gallery. For a schedule of current workshops, click here. For kids, Workshop Wednesdays is a series of fun arts and crafts classes for ages 9 and up offered during the school year. The free program is held after school on Wednesdays; sponsors and donations are appreciated. 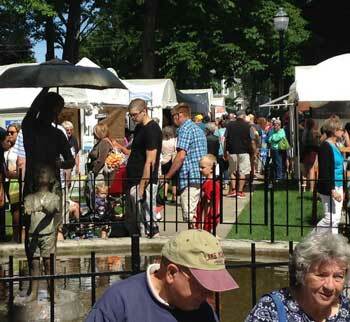 The Ludington Area Center for the Arts manages the West Shore Art Fair held in Ludington's Rotary Park. The fair which is held annually on the first full weekend in July, will be Saturday, July 6 and Sunday, July 7 in 2019. 2018 marked the 50th anniversary of the prestigious fine art fair. The fair is a juried fine arts and crafts event...which means a more stringent criteria is used and only the highest-quality artists are admitted. Juried artists are chosen to display paintings, photography, jewelry, clay, glass, fiber and wood, and many other varieties of fine art. Each year, there are over 100 artists accepted to participate in the show. In addition to the artists, the fair features live musical performances, food stations and a children's area where children can purchase art donated by participating artists for just $5. The Ludington Area Center for the Arts invites Midwest artists to apply for the LACA Indoor Juried Fine Art Fair held Saturday of Labor Day Weekend (August 31, 2019). Photographers, jewelers, potters, sculptors, glass and ceramic artists as well as painters of watercolor, pastel, acrylic, oil, and mixed media are welcome. Two non-juried arts and crafts fair are also held annually. These indoor shows feature artist and crafter participants located on different levels of the arts center. The Maritime Magic Arts/Crafts Show is held the first Saturday of June (June 1, 2019). The Ludington Arts Center Holiday Crafts Show is held the Saturday of Thanksgiving weekend (November 30, 2019) coordinating with downtown Ludington activities for Small Business Saturday and the annual Aglow on the Avenue Parade. A spring event is "Live at the LACA: Girls Rock." The event celebrates women through musical performance and spoken word. Local female musicians, singers and artists of all ages perform live at the Ludington Area Center for the Arts performance hall. For more information on Girls Rock, visit our story here. Every year around Halloween, the Ludrock group hosts its annual Night of Fright at the Ludington Area Center for the Arts, which is a frighteningly fun fundraising effort for the Center's Performance Hall. For more information on Night of Fright, visit our story here. 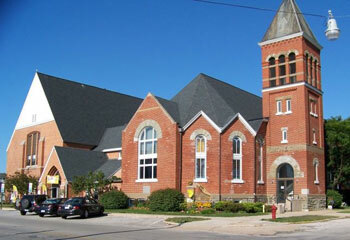 Organized and incorporated in February 2004, the Ludington Area Arts Council purchased the former United Methodist Church in downtown Ludington in September 2008. The Gothic-style structure built in 1894 has experienced significant upgrades since the Arts Center took possession and further improvements are planned. The five-phase renovation plan for the 116-year old building is an ambitious project, as the Arts Center wants to maintain the historic integrity of the structure.